BKGC is the standard golf course with 18 holes, par 72 on 350 rai of land. It is located in Bang Kradi district, Pathumthani province. One of only of golf courses located within Bangkok’s suburbs, the Bangkok Golf Club is also one of the most delightful, offering golf on cleverly designed but extremely testing fairways and greens. The golf business in Phuket Province is operated by MBK Resort Public Company Limited (MBK-R), an indirectly which MBK indirectly holds 72.61%. MBK-R has two golf courses which are currently operating open for golfers business. These include Both of the Loch Palm Golf Course (LPGC) and the Red Mountain Golf Course (RMGC) is located in Kathu District, Phuket Province. LPGC is a standard golf course with 18 holes, par 72, on an area of about 500 rai. It has been specially designed, taking into consideration the unique characteristics of its landscape. These include a large lake and a long line of fresh green palm trees which are the main elements of the golf course. For the convenience of golfers who need a warm-up before playing a round, there is a driving range located in the same area. RMGC is MBK-R second golf. It is a new premium golf course with 18 holes, par 72 on an area of over 600 rai which is adjacent to the LPGC Golf Course. The new clubhouse equipped with full amenities is located at the foot of the hill where golfers can have a clear view of the whole landscapes. In addition, it provides golfers with golf driving ranges and other facilities including putting greens for practicing, which are well maintained and look like the real ones. The driving ranges and available facilities enable golfers to enjoy the game more than before. 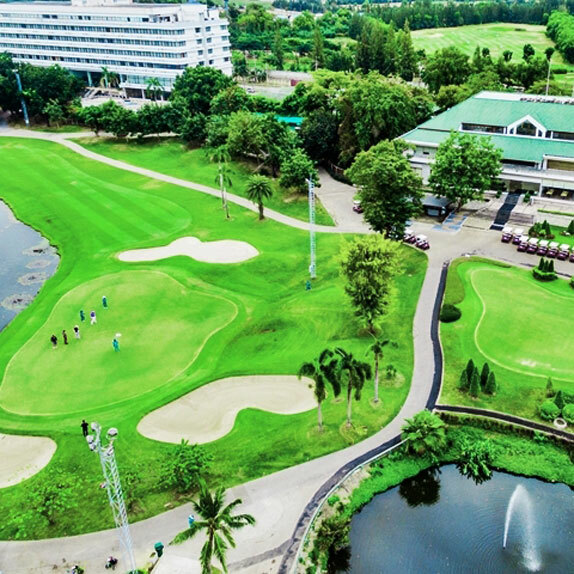 The golf business in Pathum Thani Province is operated by Riverdale Golf and Country Club Company Limited (RDGCC), with a golf course that has been open since June 2010 called the Riverdale Golf and Country Club. Located in Bang Kradi District, Pathumthani Province, it is a standard golf course with 18 holes, par 72, on an area of about 346 rai. The golf course has been specially designed, based the concept of a golf course in the valleys. To achieve such an impressive landscape, it is necessary to dig over 10 meters down into the earth. The purpose is make the golfers feel that they are playing golf in the valleys. The design also includes creation of hills in order to make the game more challenging for the golfers. As regards the club house, it incorporates modern design features and is equipped with a full range of amenities. Looking from the club house, the golfers will enjoy a beautiful panoramic view of the whole golf course as if they looked down from the top of a mountain. It also has driving ranges for golfers and a putting green which is maintained as well as real golf course in order to practice and get prepared before playing. There also has one golf course is operated by MBK Enterprise Company Limited(MBK-EP) called the Bangkok Golf Club. Located in Bang Kradi District, Pathumthani Province, it is a standard golf course with 18 holes, par 72, on an area of about 350 rai.Bangkok Golf Club was opened in December 1993 – is a 6812 yard championship layout, which includes such features as an island tee, an island green and a S shaped Par 5 (Hole # 9 named as one of the best 500 golf holes in the world by Golf Magazine USA - Year 2000 issue).